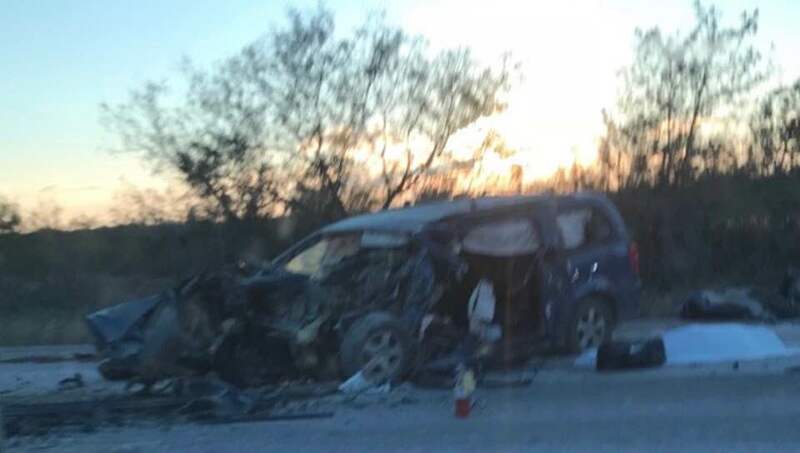 Update 11/14/18 3:00 p.m. Texas Department of Public Safety Troopers have identified the driver of a van who was killed early Tuesday morning on U.S. 67 near Tankersley. The deceased is identified as 32-year-old Matthew Ryan Werkeiser of Mertzon. He was driving a blue Dodge minivan when he crashed into an 18-wheeler that was attempting to turn left into a business. Update 9:00 a.m. A predawn crash on U.S. 67 S. east of Mertzon in Tom Green County appears to have taken the life of one of the drivers. Around 5 a.m. Tuesday morning first responders were called to a major crash with injuries. An 18-wheeler belonging to Maalt Trucking had stopped in the eastbound lane of U.S. 67 attempting to turn left into the Maalt Transport yard located at 12826 U.S. 67 S.
A blue SUV also heading east on U.S. 67 failed to stop and crashed into the back of the 18-wheeler. Texas Department of Public Safety Troopers were investigating the crash. Dove Creek Volunteer Firefighters were on the scene and there was a vehicle from the San Angelo Fire Department on scene. Tom Green County Sheriff's Deputies were also directing traffic. The crash closed down eastbound traffic. Eastbound traffic was being diverted down FM-2335 toward Knickerbocker while first responders worked the wreck. Scanner reports indicate two ambulances were called to the scene and Airmed1 was requested to stand by. DPS troopers put a sheet over the smashed drivers side of the blue SUV as firefighters used hydraulic jaws to cut away metal to reach the cab of the SUV. DPS troopers continue to investigate the crash. Update 7:46 a.m.: Our reporter on scene observed one fatality. The crash occurred between what appeared to be a blue SUV and an 18-wheeler. Both vehicles appeared to be eastbound on U.S. 67 South. The Texas Department of Public Safety is currently investigating the crash. SAN ANGELO, TX -- U.S. Highway 67 S. near Tankersley is reportedly shut down because of a two vehicle crash. Details are sketchy at this time but the Tom Green County Sheriff's Office is advising motorists to avoid the 12900 block of U.S. 67 S.
Scanner reports indicate there are possibly two vehicles in the roadway. Multiple injuries have been reported. First responders with the Dove Creek Volunteer Fire Department and the Tom Green County Sheriff's Office are on the scene.